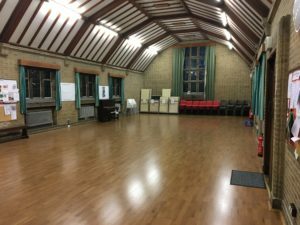 Our large church hall is available for hire Monday – Saturday for children’s parties, meetings, dances, exercise classes and the like. It’s not available for hire on Sundays when we need exclusive use of the buildings for church purposes. The approximate dimensions of the hall are 14m long x 8m wide. It its highest point the ceiling is 5m above the floor, coming down to 2.5m at the sides. Whether you are looking for a one-off event or are interested in a regular booking please contact us to arrange a viewing and to discuss your needs.